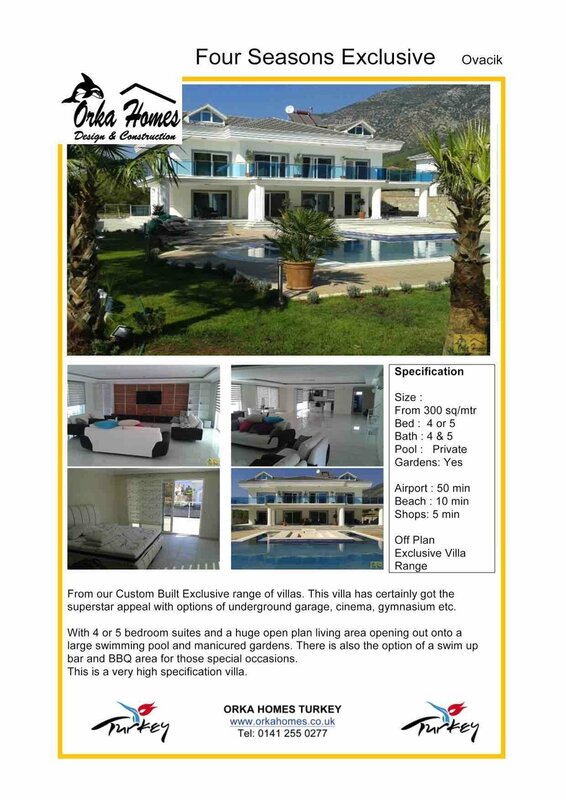 Nestled in the picturesque valley that surrounds Ovacik, these luxurious villas offer a unique opportunity for the buyer looking for a larger style luxury villa. This 4/5 or 6 bedroom villa is built over 2 or 3 levels with the basement covering an underground garage, gymnasium and indoor cinema room. From here the spiral atrium staircase leads you to the open plan lounge, dining and kitchen area with large patio windows overlooking the swimming pool and gardens. On the upper levels you will find all the en-suite bedrooms which also have walk in wardrobes. Outside the sunken seated area within the pool is a great place to relax and unwind before slipping into the large swimming pool. The landscaped gardens also includes a covered BBQ area where you can sit back and enjoy the marvelous views. Within a short walk from the villa you will find an abundance of shops, bars and restaurant with entertainment to suit everyone.